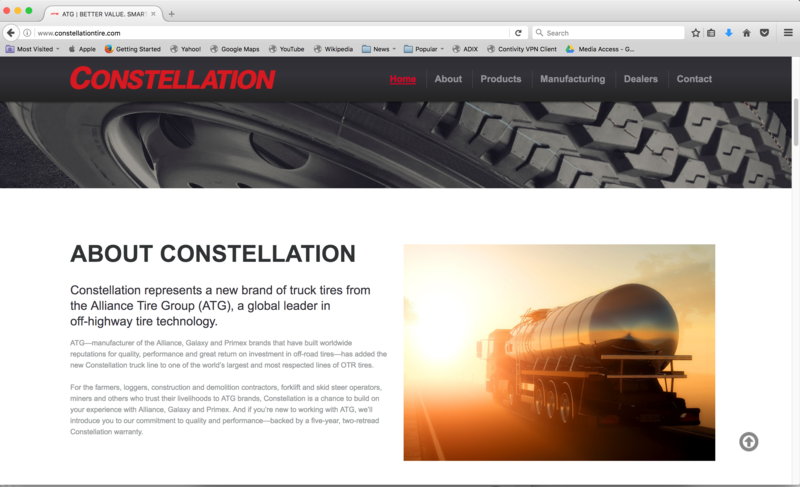 The new website includes product details on each of ATG’s 13 new Constellation medium radial truck (MRT) tires. The lineup includes tires for long-haul and regional use, as well as steering, drive and trailer positions. Most Constellation truck tires meet the U.S. Environmental Protection Agency’s SmartWay standards. “The Constellation Tire website provides a window into an exciting, new brand that provides American truckers with a well-built, strong-performing tire priced to deliver outstanding value,” says John Hull, National Truck Tire Sales Manager for Alliance Tire Americas. “There are details on the manufacturing process, quality control, customer service and, of course, the technical data and features on every tire in the lineup.